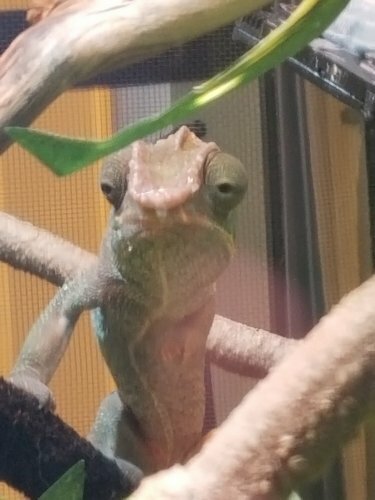 I am very new to the Chameleon world and want to get research and advice on what to purchase and how to go about things with a new little buddy before I make any final decisions. I could really use help! I had a really cool connection with a sweet little Chameleon in the pet store today, and I would love to welcome him into my life and home, but if I do this will be my first reptile. Thank you all so much and I'm excited to join with community and gain a new friend! A chameleon was my first as well. And mine is thriving. I first looked into the "resources" part of the site which tells you pretty much everything you need to know. So check that out first. And if anything is unclear or want more info about then ask away. Everyone is very helpful and its not likely you wont get a response on anything you ask. Check out the Chameleon Breeder podcast!! I’m in the same position, I haven’t purchased a chameleon yet but I’ve been doing A LOT of research. That podcast has been amazing and a wealth of info. Also this forum has been amazing. I would suggest doing all the research you can first before purchasing a pet. Thanks for adding that link i was in a rush with that post before. But yeah. Owning a chameleon is quite unique. They're definitely more of a admiring animal like fish, then a social one. But far more interesting an rewarding then fish lol. There is def a lot you need to know, but its not necessarily difficult. Once a routine is established its quite simple. You will prob need a at least 250 - 300 bucks to start up an enclosure. Auto mister is kind of necessary if you want a life lol. Yeah I’m up there too with the solarmeter that was 220 and then if you want to count my initial 400 on all the wrong stuff at the pet store. So I feel ya. My feeders are running about 80 a month now. Wow 80 a month? How many chams do you have? Lol 1 but he likes dubia. Once he is on every other day feeding it will drop to half. Oh gotcha... my guys picky ...my dubias bred with zero effort to breed so i have more then i need. But yeah after feeding every other day its much less demanding. To the OP, it's really important to both do your research and get your cage set up and running before you bring a new chameleon home. Also, I'm a strong proponent of buying a chameleon from a respected breeder (like the sponsors on here), instead of a pet store. Unless your pet store is a Mom and Pop operation that can take good care of their chameleons, a lot that come from the box stores come with issues from improper husbandry while at the store. Also, get your information for what to buy from the links on here, and the care sheets, not from the pet store - they are in business to make money and may not have your best interests at heart. Good luck!